Fishing Articles from all over the world. Terry Hollan of Reel Mexican Adventures and other top Pro's. Scientific Bass Products The true story of how "Scientific Bass Products" got started. Kick'n Bass® product review By Kick'n Bass® Pro-Staff Kip Pollay of AZOD. The following articles are by Keith Nightswoger a member of our Kick'n Bass® Pro-Staff. The following articles are by Rick La Point a member of our Kick'n Bass® Pro-Staff. Click Here for complete guide service. Gone Wacky by Kick'n Bass® Pro-Staff Jim Noah. How to Wacky Worm. Fishing the Gitzit by Kick'n Bass® Pro-Staff Leo Watson. A Bass's Sense of Sight by Kick'n Bass® Pro-Staff Leo Watson. A Basss Sense Of Smell. by Kick'n Bass® Pro-Staff Leo Watson. Be Prepared By Kick'n Bass® Pro-Staff Chuck Bauer, Big Bass Hunter. Airtight Trophy Certification By Kick'n Bass® Pro-Staff Chuck Bauer, Big Bass Hunter. Forty Niner, and I'm not talking San Fran By Kick'n Bass® Pro-Staff Chuck Bauer, Big Bass Hunter. Change your clocks, Change your tactics. By Kick'n Bass® Pro-Staff Chuck Bauer, Big Bass Hunter. 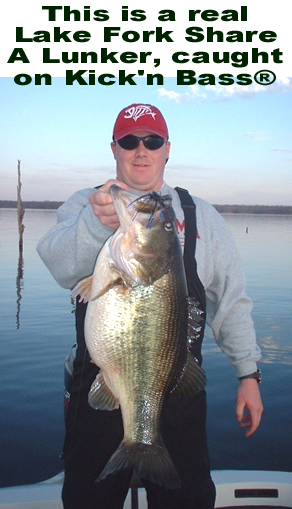 Kings of Big Bass By Kick'n Bass® Pro-Staff Chuck Bauer, Big Bass Hunter. NAFC interview with Chuck Bauer By Kick'n Bass® Pro-Staff Chuck Bauer, Big Bass Hunter. Must read article on self improvement. By Kick'n Bass® Pro-Staff Chuck Bauer, Big Bass Hunter. Sniff Sniff, Taste Taste, Bang Bang. By Kick'n Bass® Pro-Staff Chuck Bauer, Big Bass Hunter. Its A Red Ear Sunfish! By Kick'n Bass® Pro-Staff Chuck Bauer, Big Bass Hunter. All articles are by Deitz Dittrich of Minnesota. Copyright © 1996 ® Scientific Bass Products, Inc.